Kettenbach has introduced Futar Cut & Trim, a new bite registration that replaces and improves the previous product, Futar Scan. 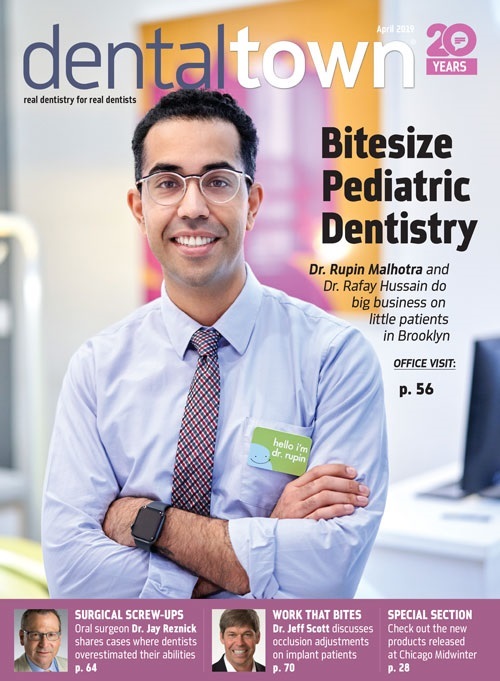 Cut & Trim, which is "scannable," has a working time of 15 seconds and an intraoral setting time of 45 seconds, for a total setting time of 1 minute. Non-slumping, this product will not flow off occlusal surfaces, and the new blue shade provides improved readability. The product's final hardness is D-35, meaning it sets rigid to eliminate any risk of vertical distortion when articulated. It also trims cleanly with a sharp blade. 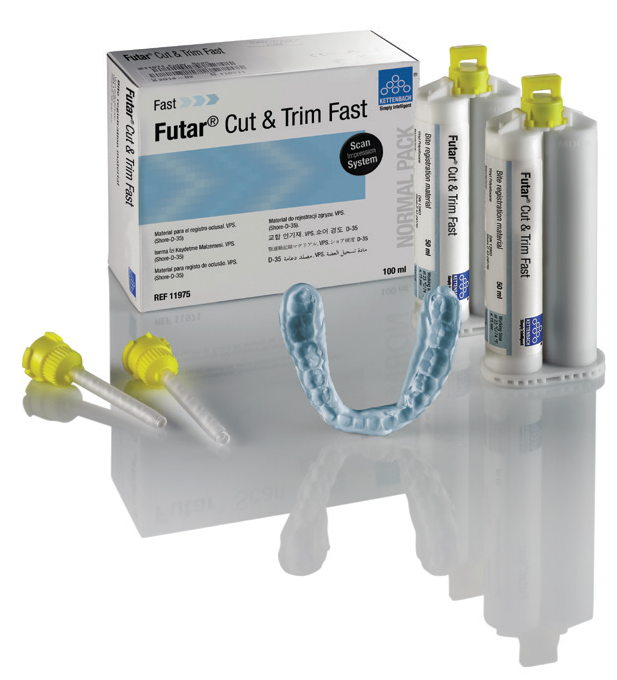 With six choices, Futar bite registration materials allow clinicians to choose the appropriate material to fit their particular needs. For more information, call 877-532-2123 or visit kettenbach.us. 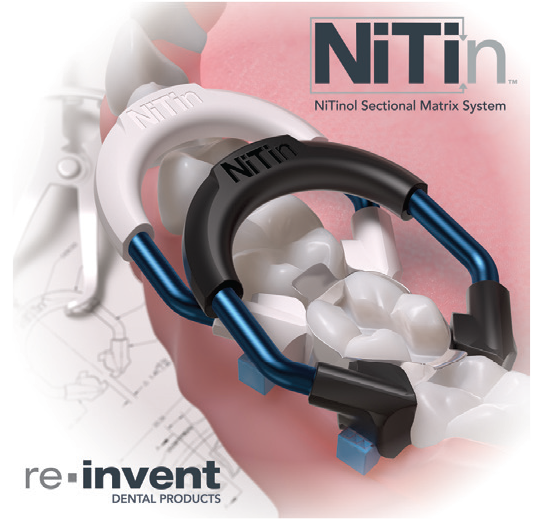 Startup Reinvent Dental Products has launched its flagship product, the NiTin sectional matrix system. Used primarily for Class II posterior composite restorations, the NiTin system differentiates itself with its ring construction. Created from drawn-wire Nitinol, the material undergoes a molecular alignment that ensures "like-new" separating forces even after hundreds of uses. Resiliency is reinforced with polyether ether ketone, a durable superplastic used exclusively in the construction of the backer and tips. The system includes matrix bands developed with a pronounced curvature; color-coded wedges to aid in separation and interproximally sealing the band; ring placement forceps; and band placement and removal forceps. For more information, call 844-200-0721 or visit reinventdental.com. 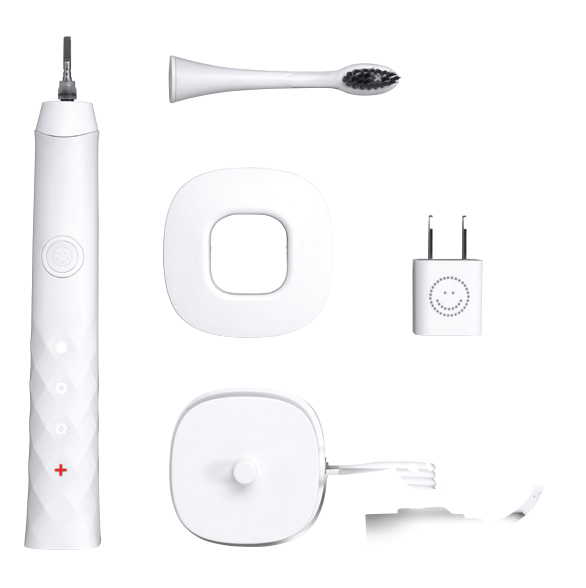 The Burst sonic toothbrush has a sleek, modern design and is available in matte white or black. The toothbrush's distinctive black bristles are coated with binchotan charcoal, which collects and absorbs potentially harmful substances between teeth and gums, including bacteria, plaque, germs and other toxins. Burst was founded by Hamish Khayat in 2017 to provide consumers with affordable, high-quality products. Through a direct-ship subscription model, consumers purchase a preliminary Burst box (toothbrush, USB charger and one toothbrush head) online or through a dental professional. For an additional cost, consumers will receive a new toothbrush head every three months. Burst features 33,000 sonic vibrations per minute and three brushing modes: whitening, sensitive and gum massage. The brush is equipped with a two-minute timer to ensure users are thoroughly brushing for a deep clean. For more information, visit burstoralcare.com. DrFirst, a provider of e-prescribing and medication management solutions, has introduced iPrescribe, a mobile medication management app that offers comprehensive e-prescribing functionality and ease of use. iPrescribe brings together the tools dentists require to securely write prescriptions for legend and controlled medications, while having access to their patients' complete medication history. iPrescribe's design provides a fast, intuitive user interface to deliver an optimal experience. Features for iPrescribe include: e-prescribing for both legend drugs and controlled substances using a two-step hard-token authentication; access to up to 24 months of patient medication history; and integration with state prescription drug monitoring program databases, in states where permitted, giving dentists additional resources to address the nation's opioid crisis as part of the prescribing workflow. The iPrescribe app can be downloaded in the Apple App Store and Google Play Store. For more information, visit drfirst.com/products/iprescribe. Ultradent Products has released the Jiffy Natural Universal Finishing System, a complement to its Jiffy Universal Finishing System. The polishers are designed to efficiently and easily reach all tooth surface areas to give a natural finish on all ceramic materials, including zirconia. They can also be used to temper super-high-gloss finishes to create the look of natural enamel. The new system consists of malleable spiral-shaped wheels designed to easily conform to tooth anatomy. Their pliable, finger-like extensions easily reach where cups and points can't, including occlusal anatomy. The system is designed to be used in conjunction with the Jiffy Universal Finishing System to give clinicians options and versatility to achieve the right aesthetic look for their patients. For more information, call 800-552-5512, or visit ultradent.com. Taub Products, a longtime manufacturer of dental consumable products, released Stellar DC Acrylic at the Greater New York Dental Meeting. The new product, a dual-cure resin, is ideal for creating patterns for copings and models, and indexing of implants. It can be light-cured in 20?seconds or will cure on its own in 60, and burns out completely and leaves no residue. The material can be layered, reproduces details accurately and grinds easily. For more information, call 800-828-2634 or visit taubdental.com. 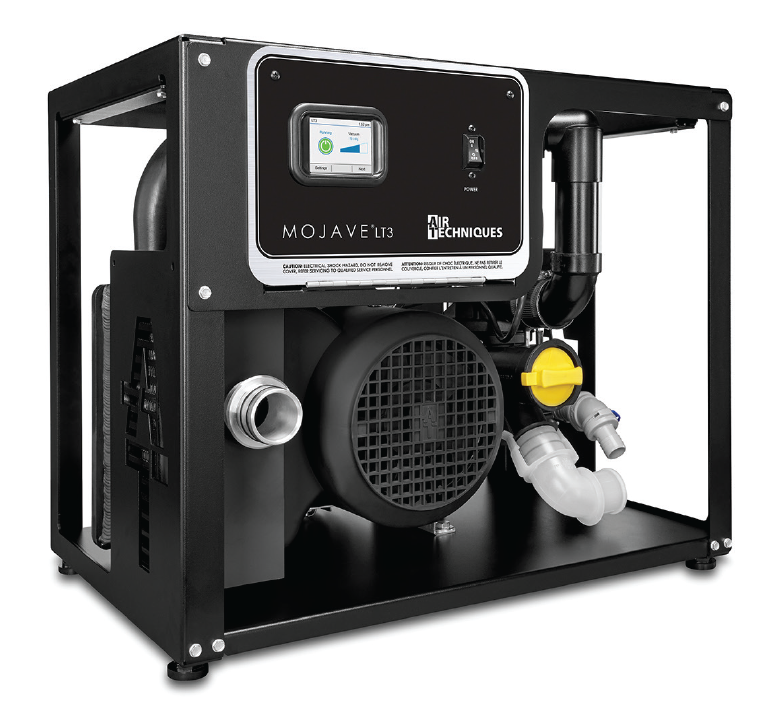 The Mojave LT is Air Techniques' latest technological achievement for its line of dental vacuum systems. Designed to replace conventional liquid ring pumps and to be 100 percent water-free, the LT eliminates the collection tank for a motor-driven air/water separator. It is engineered to deliver the highest performance while staying nearly silent. The compact size allows it to be installed in any practice, even inside cabinets. Equipped with a vibrant multicolor touch-screen display, the LT is constantly monitoring itself to make sure it's running optimally at all times. For more information, visit mojavelt.com/en. 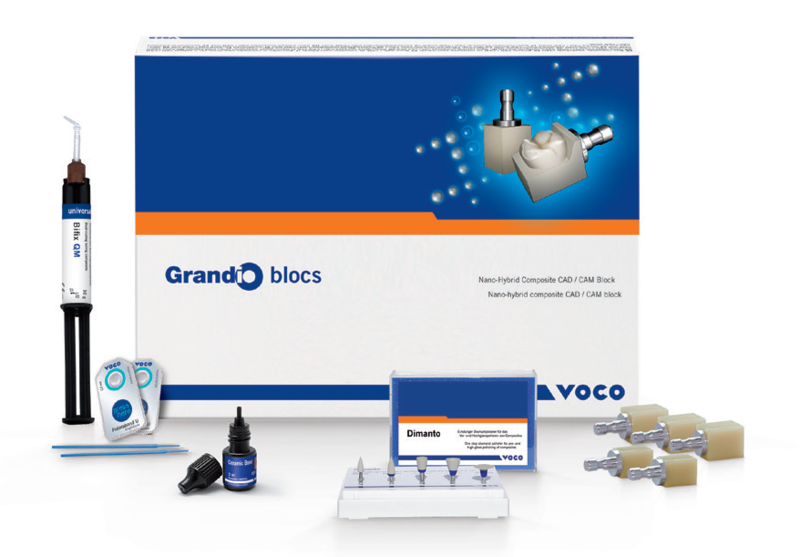 Voco's Grandio blocs are 86 percent filled nanoceramic resin hybrid CAD/CAM blocks indicated for crowns, inlays/onlays, veneers and implant-supported crowns. With toothlike physical properties, compressive strength, extremely low water absorption and natural aesthetics with enhanced color stability, Grandio provides a new solution for practitioners and labs that are looking to streamline their CAD/CAM processes and deliver high-quality restorations. Grandio offers physical properties that mimic human dentition such as modulus of elasticity and thermocycling, behaving like natural tooth structure. Complemented by its superior strength, Grandio provides a unique high-quality restorative solution. Processed using standard milling devices, they are available in multiple shades and two sizes.